IDBI Bank Executive Recruitment 2018 Apply Online for Graduate Pass to get engagement in IDBI Bank Online Form AS IDBI Executive Recruitment 2018. Bihar Police Constable Result 2018 is published for that day (15, 22 October) when written exam conducted. Selected Candidates May Check Cut off Marks of those people whose roll number is given in government department. UPSSSC Driver Result 2018 Now Check Driving Test of Selected Candidates & Joining Letter given to 138 Vahan Chalak. Adhinasth Sewa Chayan Ayog conducted UP SSC Vahan Chalak Driving on 2016-17 and now many candidates not gazetted result of these things. 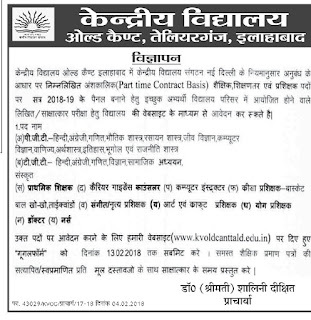 KVS Contractual Teacher Recruitment 2018 Kendriya Vidyalaya invited application to fill Part time jobs for session 2018-19. Selected candidates will be placed for 1 year as KV Contractual Teacher Vacancy. For More details & Eligibility criteria read below. UP Tourism Department Recruitment 2018 CM Yogi Adityanath Said generate 5 Lakh jobs every year in department of Paryatan Vibhag. The Candidates desirous to see the advertisement will have to click before View Advertisement to which they are desirous to see. 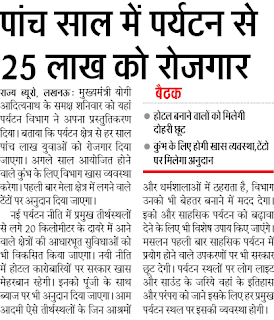 UPSLSA Recruitment 2018 UP Govt has approved to recruit in 24 Permanent Lok Adalat (Judicial Court) 144 Lipik, Peon and Chaprasi. This UP State Legal Service Authority recruitment advertisement is also available in the Commission's website http://upslsa.up.nic.in/.